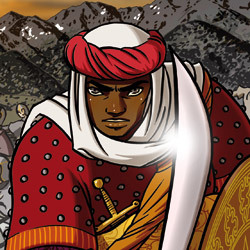 Thou Art But A Warrior is a game in which you play members of the orders of Muslim Knights sworn to defend Islamic Spain at the beginning of the Crusades. Winner of the Forge’s Setting Design Contest in 2007, Thou Art But A Warrior is a supplement of Polaris, by Ben Lehman of TAO Games. This is the second edition of Thou Art But A Warrior, which now contains the original Polaris rules and the new expansion content in one volume, along with additional writing by Ben Lehman. PLEASE NOTE: as of January 1st, 2015, I cannot sell print copies to people in the EU. I apologize for the inconvenience.